Refinancing an auto loan is far easier than refinancing a mortgage. It can save you thousands of dollars in interest and you may be able to pay off your car faster. It is important to know what is involved in the refinance process and whether this is a good option for you. Every situation is different and the first step to determine if refinancing is right for you is to take a quick look at the current market and your financial position. Interest rates have dropped since you bought your car. Your credit score has improved. This could mean that you qualify for a better rate. You financed your car through a dealership. The rates are often higher through dealer financing, so it's good to look at other sources when you can. Unlike a mortgage, auto refinancing should require just a couple of documents. Gather this information before you begin so you have all the facts when asked about it. A copy of your current loan papers. Information about your vehicle, like the VIN and current mileage. Before you start shopping for a new loan, you need to know where you stand with your current loan. What are you paying in interest? How many months do you have left on the loan? What is your current payoff amount? This is the amount you would pay the lender if you paid the entire bill today. Is there a pre-payment penalty in place? Some lenders only allow borrowers to pay off a certain amount of their loan each year without a penalty. It is more common with a home mortgage, though may apply to some car loans. While each bank has its own qualification requirements, most banks will not refinance a vehicle if it or the loan meets certain conditions. Your current loan has less than $7,500 remaining. Your car is over seven years old. Your car has 100,000 miles or more (some banks set the cap at 70,000). You use the car commercially. Your car has a salvage title. You also won't have much luck refinancing a motorcycle or RV. Some banks even rule out certain vehicle makes. Call a few banks in your area to get a feel for what the current interest rates are. You can also use a site like bankrate.com to look up the national averages. Tip: Be sure to go by used car interest rates. When you refinance, that's the rate you're likely to pay, even if you have a new car loan now. You can use an online auto loan calculator to get the job done. If refinancing still seems to make sense after running your calculations, it's time to dig into all of the details. Question the banks that you're considering about any fees that you'll be expected to pay. A small fee to transfer the title and re-register the vehicle is to be expected, but some banks may also tack on a processing fee. Ask if there is a pre-payment penalty built into the loan. You want to avoid this because it will penalize you for paying off your loan early. Once you've compared all of your options, submit your loan application to the bank with the best deal. Then, walk around feeling smart because you saved a bunch of money! 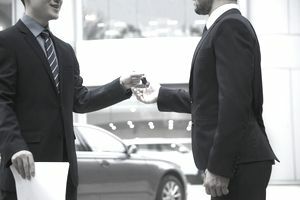 Most banks will only refinance auto loans from other banks. Don't be surprised if your current bank turns you down. Avoid cash-out refinance offers (refinancing for more than the amount owed so you get the difference in cash). That may be an option with a home mortgage, but not the best for a car. These add to the length and cost of your loan and a car loses value quickly, so it's not likely to save money.